Is your mattress too firm? A high quality memory foam mattress topper may be a solution. It is important to note that not all memory foam mattress toppers are created equal. Over the past couple of years the market has been flooded with low density, low quality memory foams at low prices. With all the direct to consumer venture capitalist funded memory foam mattress brands available online, it is hard to know who to trust. The consumer is left entirely on their own to determine which memory foam mattress topper is best. Every Direct-to-consumer brand (DTC) “a form of e-commerce that involves a direct transaction between manufacturer and buyer” is touting that their product or brand is better than their competitors. Many of these (DTC) brands are less then three years old, and are not as interested in offering a “high quality product” as they are in sales volume or number of sales. Selling product in large numbers shows viability to their investors. 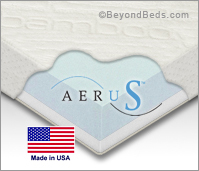 We at onlinebedstores.com recommend a mattress topper made with a high density 4 lb. memory foam of at least 2”. Ideally the pressure relieving memory foam layer should be laminated to a firm support base foam. The combination of a softer pressure relieving cushioning layer on top of a firmer base foam for support makes for the perfect mattress topper. After all, if you are looking to avoid replacing your mattress, why not resurface it with a mattress topper that is constructed like a “memory foam mattress” with dual layer construction. See our “OBS Recommended Online Retailers” below for more information.